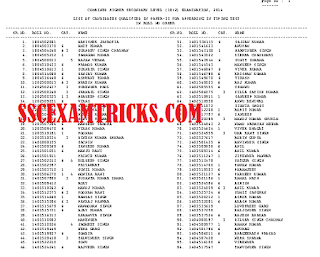 SSC CHSL (10+2 Level) Final Result 2015 Declared Download SSC CHSL 2015 Appointment Letter / Joining / Allotment Stations. The latest news is that staff selection commission has declared the final result of combined higher secondary level examination final result on 09th October 2015 on the official website www.ssc.nic.in. The name, roll number, category and rank number has been published in pdf file which can be downloaded here. Those candidates who are waiting for their final result, they can check it from direct link available here. Total 2575 candidates have finally selected for the posts of LDC DEO in various government departments. These selected candidates will be allotted appointment letter and station to join their duty. The joining date will be mentioned in the appointment letter. The appointment letter will soon be released either on your permanent address or your email ID. Candidates are suggested to check their email ID regularly for appointment offer letter. The appointment letter contains terms and conditions regarding the posts. Read them carefully before putting signature on it. Latest News SSC LDC Result 2015- Staff Selection Commission has announced result of Lower Division Clerk (LDC) Data Entry Operator (DEO) 10+2 Level Descriptive Test on 16 June 2015 on official website www.ssc.nic.in. 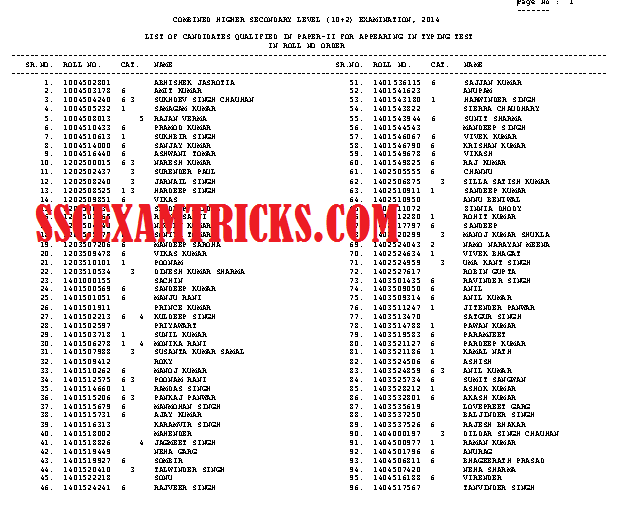 The SSC LDC DEO Descriptive test Merit list can be downloaded from the direct link given below. The Marks for SSC CHSL (10+2) Exam 2014 has been available on 24.07.2015 on official website www.ssc.nic.in. The result has released in PDF. You can download result by clicking on the links here. SSC had conducted Combined Higher Secondary (10+2) Examination, 2014 (Descriptive paper) on 10.05.2015 at various centres across the country. Total 36845 candidates had attended this descriptive test. The result has got declared now. A total of 6728 candidates have qualified for skill test and 10634 candidates have qualified for typing test. SSC has published LDC DEO Cut off mark for general, OBC, SC/ ST category candidates to shortlisted candidates. These shortlisted candidates will be called for skill test and typing test. The date, time and venue of skill test and typing test will be intimated very soon on official website www.ssc.nic.in. SSC has prepared merit list on the basis of performance in written test (Paper 1) and descriptive test (Paper II). The SSC LDC DEO Cut off Marks is given on the image shown below. SSC CHSL Result 2015 refers as result of qualified / not qualified candidates who had appearedin in SSC 10+2 Level LDC DEO Descriptive Exam 2015. SSC CHSL Merit list will be prepared on the basis of marks obtained by the candidates in objective written exam. The SSC CHSL Descriptive Test will be of qualifying nature and no marks will be added in preparing merit list of candidates for Typing Test held for SSC CHSL 10+2 Level LDC DEO Recruitment 2014. The qualified candidates in result of SSC CHSL LDC DEO Descriptive exam will be called for Typing test. Earlier SSC CHSL Admit card had released on 27th April 2015 for Descriptive exam for SSC CHSL LDC DEO Recruitment 2015. Staff selection commission (SSC) had conducted Combined Higher Secondary Level (CHSL) on 10th May 2015 at various centres across all over the country for SSC 10+2 Level LDC DEO various posts in various Government Departments. The Latest news is that SSC is working on checking SSC CHSL Descriptive exam and preparing result / scorecard / marks details of all candidates who had appeared in SSC CHSL Descriptive Exam for 10+2 Level LDC DEO posts. The result is expected to be released in first / second week of July 2015 on official website www.ssc.nic.in. Those candidates whose had appeared in SSC CHSL descriptive examination for 10+2 Level LDC DEO Posts and they can download their result / scorecard / marks details / cut off marks from direct link given here. SSC CHSL LDC DEO 2015 Descriptive Exam Syllabus: The syllabus of SSC CHSL Descriptive Exam had published on 19th July 2014 notice released by SSC. The SSC CHSL LDC DEO Descriptive Exam was having questions from four sections of 50 marks each. The time duration for SSC CHSL Descriptive Exam was 2 hours. SSC CHSL LDC DEO Objective Exam Result/ Scorecard / cut off marks: Earlier SSC CHSL LDC DEO Objective Examination was held on 02nd, 09th, 16th November 2014 & Re-Exam was conducted on 15th February 2015. SSC had released result / cut off marks / scorecard of SSC CHSL Objective & re-examination on 18th April 2015.